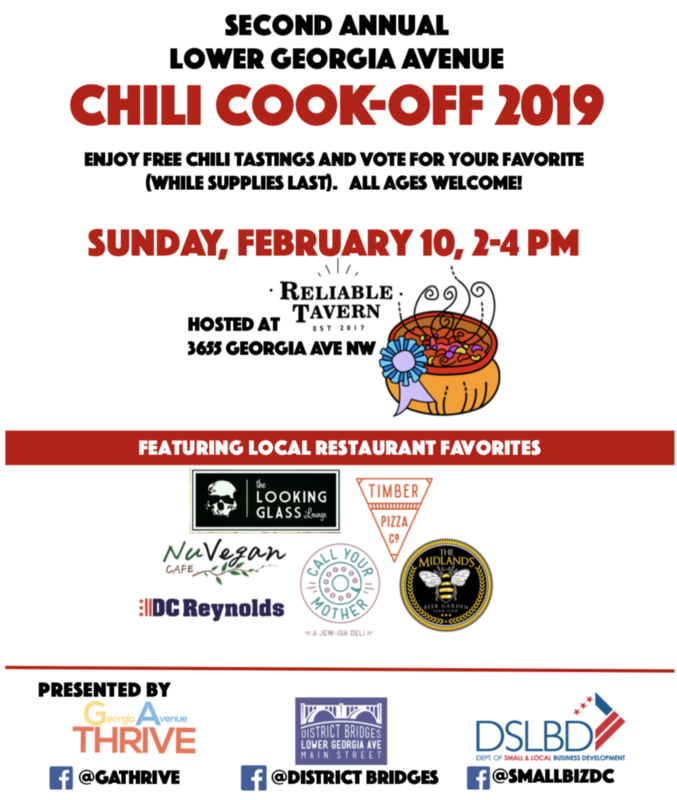 On Sunday, February 10th from 2-4pm, local restaurants will be competing for bragging rights in the Second Annual Lower Georgia Avenue Chili Cook-Off. District Bridges' Lower Georgia Ave Main Street and Georgia Avenue Thrive have organized this free event where neighbors can try samples of each dish and vote on their favorites. From 2:00pm to 4:00pm, Reliable Tavern will be hosting the Chili Cook-Off on the basement level (stairway entry). The featured local Lower Georgia Avenue restaurants are DC Reynolds, The Midlands, NuVegan Café, The Looking Glass Lounge, and a mash-up with Timber Pizza Company & Call Your Mother Deli. The competing chefs will each prepare a unique entry that is not available on their regular menus. A distinguished panel of judges will also be weighing in for the coveted Judges Choice Award. This is a family-friendly event and all ages are welcome. Chili samples will be served as long as supplies last. Purchase of alcohol requires photo ID. The event is made possible through funding support from the DC Department of Small and Local Business Development and neighborhood volunteers. Looking forward to seeing you there!